Since 1950 the Russian pattern has been described by many writers as a design patent, specifically no. 12,982, that was granted to the cutter Philip MacDonald on 20 Jun 1882. It is now known that MacDonald’s design does not represent the Russian pattern. (MacDonald’s pattern is composed of four intersecting sets of parallel miter cuts, three of which produce hexagonal hobnails. The Russian pattern has six intersecting sets of parallel miter cuts, four of which produce octagonal hobnails.) It is suggested that this non-Russian, patented pattern be referred to as the “MacDonald” pattern, until its official name is discovered. 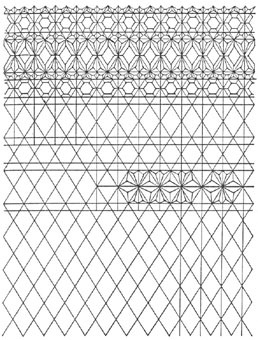 A row-type pattern, it is shown in note 1. On 18 Jul 1882, twenty-eight days after the MacDonald patent was issued, patent no. 13,043 was granted to Edward T. Burgess. The Burgess patent, which was the third one granted to him on that day can also be seen in note 1 where it is set along side the MacDonald patent. 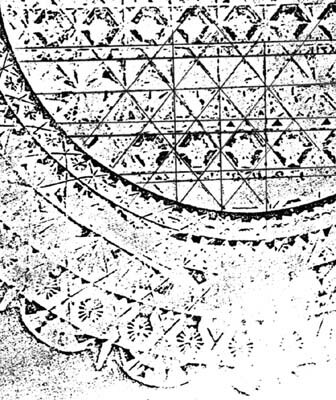 The two patterns are similar when the row of open diamonds in the Burgess design is bisected by a horizontal miter cut — an option that is shown at the bottom of the patent’s drawing. An assigned name, “Burgess III” (“with or without Option”), is suggested for this pattern until its catalog name is also discovered. The MacDonald patent and the third Burgess patent use four and five intersecting sets of parallel miter cuts, respectively. Therefore, it is not possible for either of them to represent the Russian pattern. Before proceeding to a discussion of the Russian pattern, it is worthwhile to take a look at the three Burgess patents. They are brought together here in the following series of excerpts from the patent drawings (graphs). Surprisingly, the first patent (Burgess I), on the left, is an “almost Russian” pattern. As in the case of Burgess III, Burgess I also offers an option, not illustrated here, of a set of horizontal miter cuts, positioned through the pyramidal stars. This set is in addition to the four intersecting sets of parallel miter cuts that are shown in the drawing. In other words, the Burgess I patent, with option, has five intersecting sets of parallel miter cuts. It lacks only the sixth set (vertical cuts through the pyramidal stars) that would turn it into the Russian pattern. Although values for the angles used by Burgess are given in the specifications for his three patents, they are, with one exception, of little value. To be useful these angles would have to be used on a grid that has an aspect that is identical to that used by Burgess, but this might not be an aspect that is appropriate for the task at hand. (Aspect = width / height. A square has an aspect of 1.00; a standard TV screen, 1.33.) The exception is Burgess I where the grid can be determined empirically to be a square. In Burgess II and III the aspects are less than 1.00. As a result, elements in these designs appear somewhat “elongated” compared to those in the “Burgess I” and Russian patterns. Incidentally, the grids used for the diagrams at the beginning of this Web page, and in the How to Identify the Persian Pattern file, are not perfect squares. 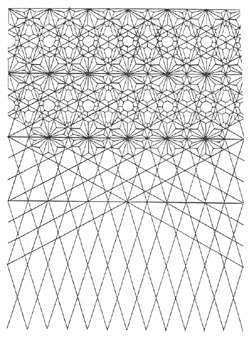 Whoever prepared these drawings for J. Hoare & Company used a grid with an aspect of 1.09; as a result the patterns appear very slightly “squashed.” In practice, construction of the Russian and Persian patterns depends upon connecting vertices and midpoints of squares; measured angles are unnecessary (note 2). Rectangles can be used, as well as squares, but usually one can clearly see a “square grid” in actual examples of these patterns. It has been noticed that when the Pearsons discussed the Russian pattern (Pearson 1965, p. 37) they referred to “the hexagonal [form] or ‘hobnail'” as being part of MacDonald’s description of his pattern. 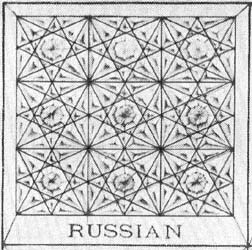 But, as shown on the right, the Russian pattern must have octagonal, not hexagonal, “hobnails.” (Four octagonal hobnails surround the central pyramidal [prismatic] star. The perimeter of one of them has been darkened here for emphasis.) Because of this discrepancy it was decided to examine MacDonald’s complete patent application in detail. This led to the repudiation of the argument that the MacDonald patent is the source of the Russian pattern. In addition to the octagonal hobnail, the “box” that contains the pyramidal star has also been darkened. Both the octagonal hobnail and the octagonal box are necessary conditions for the Russian pattern. But note that they are not sufficient; “Burgess I” also shares these characteristics. An actual example of the “Burgess I” pattern, with or without the option, has yet to be found. The “Burgess II” pattern is similarly elusive. Because the present condition of the MacDonald illustration is quite poor, it is believed that the original illustration (or copy thereof) probably was not suitable for publication in Daniel’s book. To obtain a publishable print it seems likely that she turned to Samuel Hawkes as it was he who gave her “suggestions, help, and guidance during all the years” that she spent on her book. Moreover she wrote that “Mr. Hawkes is directly responsible for the identification of many of the more important patterns.” (Daniel 1950, p. 18) If Samuel Hawkes did give Daniel the illustration, he simply gave her the wrong one. That is, he gave her the Russian pattern, as requested, but he failed to notice that this illustration does not conform to the pattern described in MacDonald’s application papers. This is not as unlikely as it might at first appear. Samuel Hawkes, unlike his father, was not an experienced glass cutter but was trained mainly in the commercial aspects of his father’s business. (He did, however, design a pair of patented designs, but they are in the “realistic” (floral) style, not the geometric style of the Brilliant Period.) Furthermore, it is known that Samuel Hawkes confused the Princess and Devonshire patterns and gave incorrect information to Daniel. This major error was not discovered until 1994 (note 3). The difference between the Russian and the “MacDonald” patterns is less than the difference between the Princess and Devonshire patterns, and therefore the former patterns are even more likely than the latter patterns to have been incorrectly identified by Samuel Hawkes. The Pearsons, Revi, and subsequent writers who have discussed the MacDonald design patent have based their work on what Daniel published in 1950. If these later investigators had sought out the patent’s illustration, or had read the verbal description of MacDonald’s patent with care, Daniel’s error would have been discovered and not passed on down through the years. The writer also believes that the strong association between the Russian pattern and the T. G. Hawkes Glass Company that developed during the years following the pattern’s introduction worked against the discovery of Daniel’s error. This association probably lulled collectors, dealers, and researchers into a ready acceptance of a non-existent patent for the Russian pattern. In the section where Revi discusses Hawkes’ Russian pattern, he indicates that competing companies waited until “McDonald’s (sic) patent had run its term of seven years…” (Revi 1965, p. 176), that would be 1889. This conflicts with the facts, some of which Revi himself provides, that indicate that the Russian pattern was being extensively cut in the years before 1885, well within the supposed period of patent protection. The cutting shops included those of the Meriden, New England, Mt. Washington, Hoare, Straus, and Dorflinger companies. The New England Glass Company listed “Cut Russian” in its c.1885 catalog, according to Revi (1965, p. 22). Some writers have explained the extensive cutting of the Russian pattern by companies other than Hawkes by using the supposition that Hawkes gave permission to have his patented pattern copied. It would be surprising if T. G. Hawkes, an astute business man, would do this, with the possible exception of the Dorflinger company with whom he co-operated on occasion. Now, of course, there is a much simpler reason for the widespread cutting of the Russian pattern — no patent ever existed to offer protecction. Additionally, if there were such a patent, then there would most likely be mention of “permissions” in the Hawkes correspondence, if not accounts of legal action taken against those companies that violated the patent. No such evidence has come to light. 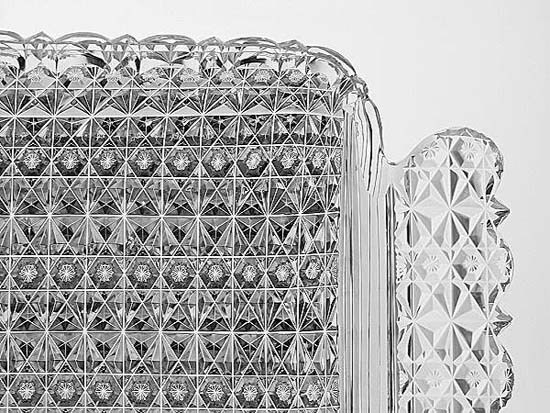 In this connection an even more basic question might be asked: Is there any mention of a patented Russian pattern in the extensive file of correspondence in the Hawkes Archive at the Rakow Library, Corning Museum of Glass? No, there is not. As mentioned briefly in the Introduction to the Russian Pattern file, it is worthwhile recounting how the name “Russian” came about, for it did not always have this name. Most accounts re-tell a story that originated with Daniel, involving the ordering of a banquet service in this elaborate pattern for the Russian Embassy in Washington, D. C. “McDonald’s (sic) design was selected, became tremendously popular, and was thenceforth known as the Russian.” (Daniel 1950, p. 184). The true story of the naming of the Russian pattern has been told by Spillman (1996, pp. 237-40) who has been able to examine correspondence sent to the T. G. Hawkes company during the 1880s. On 14 Sep 1881 William L. Briggs of the firm of Richard Briggs, Boston, a major commercial customer, wrote to Hawkes requesting that this pattern, heretofore known as no. 283, be referred to as the “Russian” pattern in the future as “It is very confusing to my employees to remember the different cuttings by their numbers …” There is a strong probability that the Russian pattern, then known as no. 283, was among the first patterns cut by the Hawkes firm, which was founded in 1880. This is especially likely if the company was already cutting the old “Star and Hobnail” pattern at this time, as seems likely. 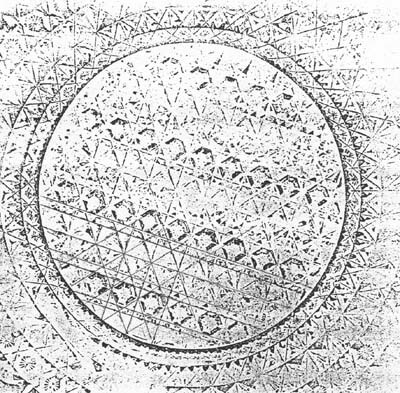 Although we now know for certain that Philip MacDonald’s patent had nothing to do with the Russian pattern, and that there is little doubt that the pattern developed from the earlier Star and Hobnail (Russian Cleveland) pattern, where and when the Russian pattern first appeared remains a speculation. At the present time Corning, NY, c1880, is as good a bet as any. “Russian-like” refers to patterns that appear, at first glance, to be the Russian (or even the Persian) pattern but which prove to be something else when analyzed. It is not unusual to find them offered for sale as “the popular Russian pattern.” Here are three that the writer has come across; there are, undoubtedly, several more waiting to be discovered. 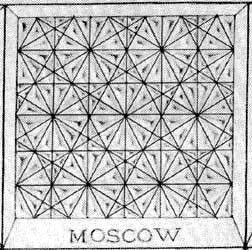 The Moscow pattern, on the right, is taken from the same catalog as the drawing of the Russian pattern at the head of this file. It has the requisite six intersecting sets of parallel miter cuts, but it has no hobnail. The pattern is based on the hexagon and is actually a large-scale version of the hobnail pattern (four intersecting sets of parallel miter cuts) with two additional sets of parallel miter cuts and a closer spacing within the original four sets. 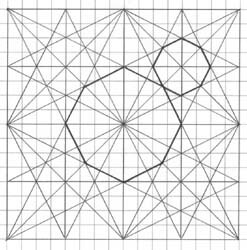 This results in dividing the hexagonal hobnail into 12 segments and dividing the pyramidal triangle into six segments. 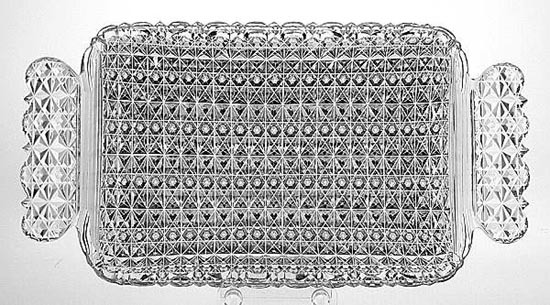 Although a Moscow pattern was ordered from T. G. Hawkes Rich Cut Glass in the early 1880s, it is not known for certain that the ordered pattern, named by Briggs along with the Russian pattern, is the same as Hoare’s Moscow pattern. It probably is. The New England Glass Works also cut the Moscow pattern, calling it Belgian. It is illustrated in the company’s BLOWN AND RICH CUT GLASSWARE catalog of the mid-1880s. The copy of this catalog that is on file at the Rakow Research Library (F-63C) has the pencilled notation “June, 1886” on its title page. It is not immediately apparent that this cologne bottle is cut in the Moscow pattern. 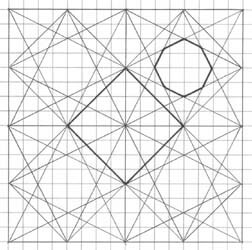 This is because the pattern shown in the drawing has been rotated 45 deg. The bottle has the acid-etched trademark of the Maple City Glass Company, a cutting shop owned by T. B. Clark & Company. Note the thin lip, which is original. Also, the base of the stopper is convex and has no bevel. Cologne bottle cut in the Moscow pattern by Maple City (signed), c1900. 24-pt single star on base. H = 6.25″ (15.9 cm), W = 2.75″ (7.0 cm). Sold for $150 in 1989. It is easy to confuse the Moscow pattern with the Kohinoor and “hexad” motifs, which also use six intersecting sets of parallel miter cuts and are also based on the hexagon, but these motifs use wider spacings between some of the miter cuts. Usually the Kohinoor and “hexad” motifs, which are discussed elsewhere, are cut on a much smaller scale than is the Moscow pattern. The unusual pattern, below on the left, is found in full color, red cut-to-clear, in Wiener and Lipkowitz (1974, p. 161 top), where it is incorrectly identified as the Russian pattern. It has eight intersecting sets of parallel miter cuts. (And there are single stars on the octagonal hobnails.) This is the only example of this pattern that the writer has seen to date. Its origin is unknown. 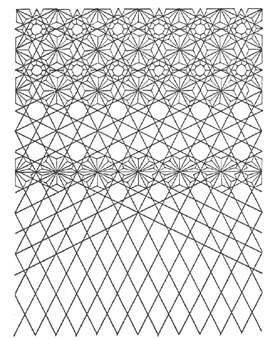 Another “Russian-like” pattern that results from eight intersecting sets of parallel miter cuts is shown below on the right. 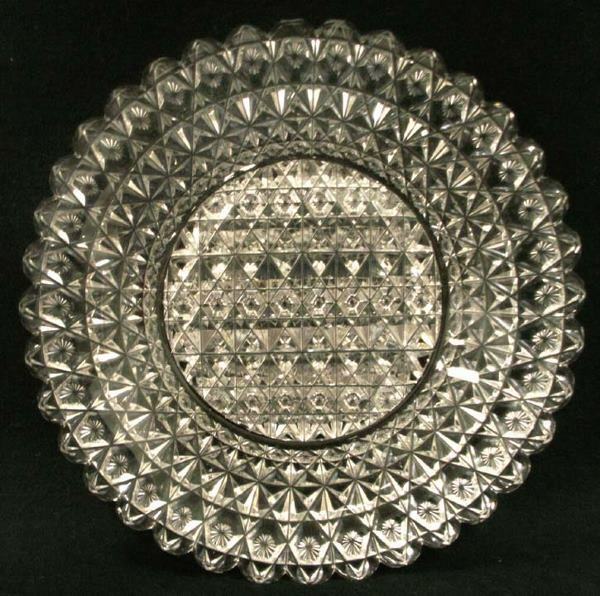 It is sometimes referred to as “the Russian pattern with a prismatic hobnail”. But, with eight sets of miters, it must be described as a close relative to, rather than a member of, the Russian family. Note how the layout of the pattern differs from the layout that is used for the Russian pattern: Two additional sets of miter cuts have been added, at 45 deg and 135 deg. In addition, there is closer spacing of two of the six intersecting sets of miter cuts that are used in the Russian pattern, those cut at 0 deg and 90 deg. All this results in the segmentation of the pattern’s hobnail. The writer has had a small dish in this pattern and, until recently, it was the only example he had seen. However, an additional example is currecntly begin exhibited at the Corning Museum of Glass where the pattern is incorrectly identified as Russian (note 5). This pattern was probably in use during most of the 1880s and 1890s, but probably seldom cut. Its maker is unknown. 1. Shown below are the MacDonald (left) and Burgess (right) patented patterns as originally presented in this file. The writer has darkened some of the horizontal miter cuts in the “MacDonald” pattern in order to enhance the image for reproduction. In doing this he darkened miter cuts that do not exist (!) and, consequently, he incorrectly stated that the two patterns (the latter with its option) are identical. They are not, and the writer regrets any confusion his error might have caused. The U. S. Patent Office was correct in 1882 when it issued two separate patents for these designs. The following re-scan of the central section of MacDonald’s patent illustrates how the aforementioned error occurred. The enhanced section of the plate, shown above, is repeated here in the lower portion of the image. The upper portion has not been enhanced, yet it seems to show closely-spaced pairs of horizontal miter cuts. These are illusionary: Only the miter cuts that form two sides of the rows of hexagonal hobnails are real; the others are actually rows of facets. In other words, the “MacDonald” pattern does not contain the pairs of closely-spaced horizontal miter cuts that are part of the “Burgess III” pattern. The writer has learned a valuable lesson: any “enhancements” must be undertaken with extreme care and only after considerable deliberation! Early in 2003, the following images of a full-size ice cream tray appeared on the Internet. The pattern the tray displays is an excellent presentation of the “MacDonald” pattern, cut on shape no. 217: L = 15″ (38.1 cm). One can clearly see that there are no closely-spaced pairs of horizontal miter cuts, which would, if present, identify the pattern as “Burgess III with Option” (a design, incidentally, that has yet to be seen in the real world). The parentheses in the “Burgess I” row enclose the option for that pattern. The option in “Burgess III” is already included in the 0 deg angle. 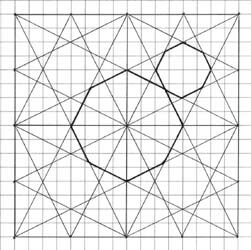 The angles in the “Burgess I” pattern are also found in the Russian pattern but these angles are identical only if both patterns are cut on square grids. The Russian pattern necessarily adds two more sets of parallel miter cuts: at 0 deg and 90 deg. Why did Burgess not include a sixth set of miter cuts (90 deg) in his first patent as a second option, and thereby transform his design into the Russian pattern? Probably because such a design would not have been accepted by the Patent Office. The Russian pattern (that is, Russian Cleveland or Star and Hobnail) was likely considered “generic” (in the public domain) even at this early date (1882). This pattern-identification is obviously incorrect. (Compare the Corning 1a and Corning1b files in the Correction folder in Part 4 for similar errors.) In addition to having a pattern that has not yet been identified, the glass has an inverse baluster (IB) stem which is cut with six flutes. As an IB stem there is a knop just below the bowl; interestingly, it is incorporated into the paneled stem rather than faceted separately which is usually the case. The glass’s foot is scalloped and has a radiant (radiating) star. At the time of viewing, the glass was located one shelf above the repaired lamp that is mentioned in the Corning 1b file. The lamp’s pattern has also been incorrectly identified by the Museum.